An integral part of any micro-abrasive blasting system, nozzles provide focus and acceleration to the abrasive stream generated by the blaster. 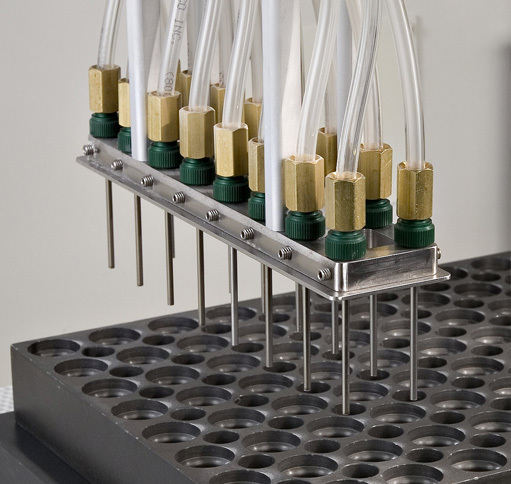 The superior quality of Comco nozzles guarantees the highest level of repeatability with every blast. A quality nozzle starts with a great design and follows with a solid construction using the best materials. To provide you with the best performance, each Comco nozzle is manufactured from high-grade tungsten carbide. We found this material provides the best value for the abrasive environment. All of Comco’s nozzles are color-coded for easy identification and optimal efficiency. Hi/Performance nozzles have 3-5x the life of standard nozzles. Any turbulence within the nozzle will significantly decrease the nozzle’s life. Since the nozzle is the center of this acceleration process, our engineers design nozzles to handle abrasive carefully and provide a smooth transition for the abrasive at its entry and exit points. Abrasive particles must travel fast and straight in order to be effective. The design of the Hi/Performance nozzle reduces overspray by 30%. Proper focus increases the efficiency of the abrasive, ensuring every particle strikes the targeted area. The internal geometry of the Hi/Performance nozzle speeds up particle velocities by 30%. Higher velocities remove more material faster. Hi/Performance nozzles are available for the MicroBlaster and AccuFlo (ComfortGrip) handpieces. The Straight, Round Nozzle with openings ranging from 0.015″ to 0.060″ works best for most applications. The Rectangular Nozzle creates a wide sweep or cuts precisely. Large Nozzles accommodate the increased powder flow of production blasters and funnel it in precise, controlled streams. Large nozzles are generally 0.060″ to 0.125″ in diameter and fit Comco’s PowerFlo and DirectFlo blasters. The Ring Nozzle focuses multiple streams of abrasive to more effectively process wire applications. Comco develops Custom Nozzles for special applications. Angled and Extended Nozzles direct the abrasive stream into hard-to-reach areas. Many MicroBlasting applications start out as a manual process, but as production volumes grow, automation becomes a necessity. Comco blasters are ideal for both environments. Nozzle fixturing is a critical part of this transition, and Comco’s nozzles and accessories are designed to ease this transition. In a manual configuration, the handpiece is a key component of the system. It must offer the operator comfort and precision. 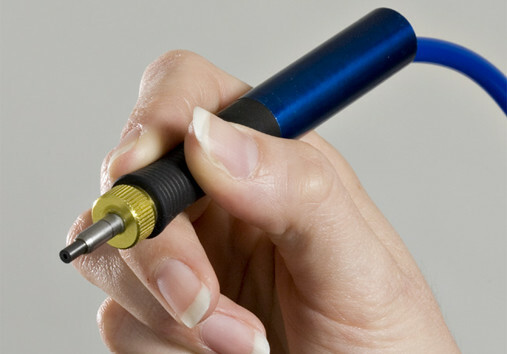 Comco’s ComfortGrip handpiece has an ergonomic shape and textured surface to improve comfort. It flexes easily with the hose, allowing an operator to make precise motions. The ComfortGrip handpiece is designed exclusively for use with our line of AccuFlo nozzles. All of Comco’s nozzles can be easily fixtured for automation and simply aligned with the assistance of Comco’s precision machined nozzle holder. 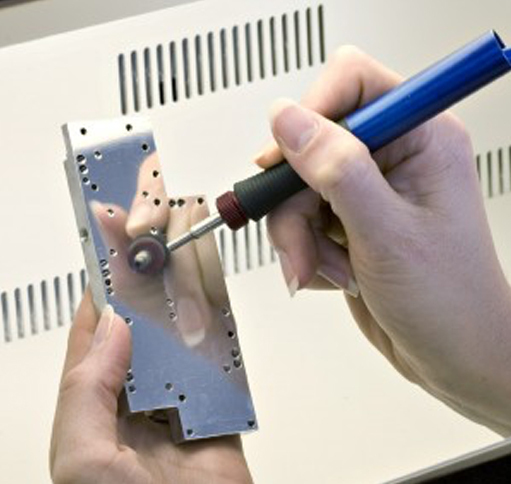 Our engineers provide detailed drawings and examples of the fixturing process with every system purchase.